An Italian eatery and wine bar set in downtown Bismarck. 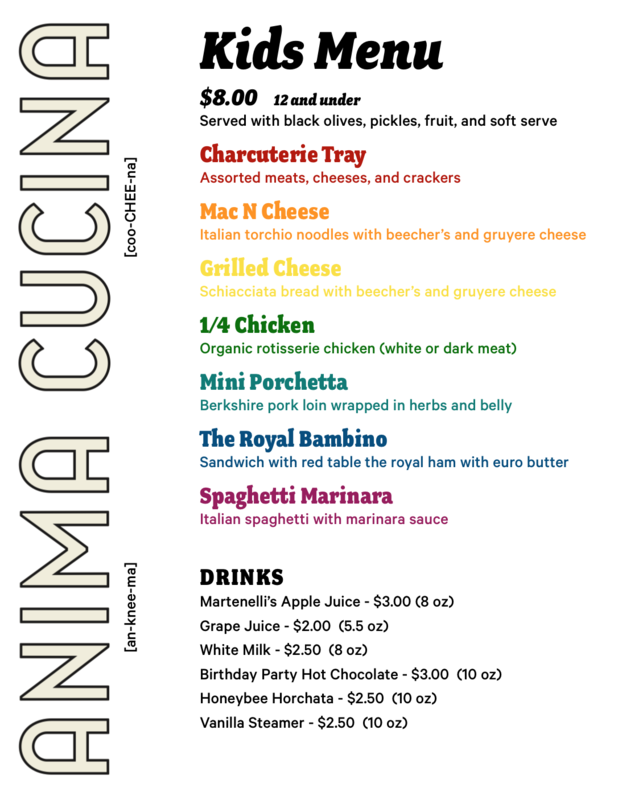 Anima Cucina is inspired by the the soul of “la bella vita”; the good life that connects us all. Validated parking available in the Parkade Ramp. Housemade bread options: corn oat molasses, multigrain seed, English muffin. Minnesota family-owned winery in Croatia! Our roaster is Dogwood Cofee based in Minneapolis. We offer a variety of custom catering options for your consideration. We will work with you to find the best option for your party and budget. Pick-up coffee and pastry, and sandwich or charcuterie platters at your convenience. Delivery and set-up of our catering platters or hot food at your requested location. A 15% service charge will apply to any order. Minimum service charge is $20. Deliver, set-up, and stay on-site to manage buffet table throughout your event. Limited to two hours. A 25% service charge will apply to any order. Minimum service charge is $100.